At Recycling Your IT, we run a profit-sharing scheme whereby depending on the value of the equipment we collect, a proportion of the profits gained from our remarketing services can be shared back to you, the client. This scheme can help you make substantial annual savings and helps to offset any of the costs involved with upgrading to new equipment. The majority of assets that come through our doors are refurbished and remarketed, giving equipment a second-life and helping work towards a more sustainable environment. Our aim is to extend the life of IT equipment for as long as possible, not only offering money back to our clients but helping to preserve the planet as well. The money we offer back depends purely on the value of the equipment. Often equipment under 3 years old will still hold some value, making the chance of a rebate significantly more likely. 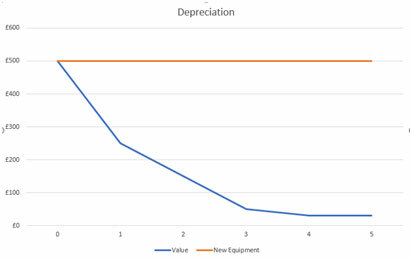 The graph below shows the likely depreciation of an IT asset that was bought for £500. Our remarketing team are experts in realising the value of an item, the more information you can supply us with e.g. serial number, components, storage disks etc. the better estimation we can make of how much potential of a potential rebate you could receive. Give us a call today on 01279 215000 to see how much you could receive back from disposing of your redundant IT equipment.